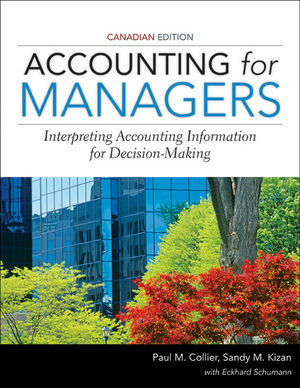 The Canadian edition of Accounting for Managers: Interpreting Accounting Information for Decision-Making builds on the success of the original textbook that was published in the United Kingdom. This book was motivated by a need for a “decision-focused” accounting textbook for both MBA and undergraduate programs. The title of the book emphasizes the focus on accounting to meet the needs of managers. The material contained in the book stresses the interpretation (rather than the construction) of accounting information as well as a critical (rather than unthinking) acceptance of the underlying assumptions behind accounting. It is suitable for postgraduate and undergraduate students who are undertaking courses in accounting that do not lead to professional accreditation, and to practicing non-financial managers who need a better understanding of the role of accounting in their organizations. This Canadian edition book has been adapted to include materials, examples and case studies with a Canadian focus. Part I provides a discussion of financial accounting, with particular focus on international financial reporting standards and practices. Part II concentrates on management accounting information for planning, decision-making and control, while Part III provides the supporting information including relevant readings that demonstrate some current research and literature in management accounting.